On April 6, 2018, Attorney General Jeff Sessions notified all U.S. attorneys along the U.S.-Mexico border of a new “zero tolerance” policy toward undocumented migrants. Henceforth, the Department would seek to prosecute, in the federal criminal justice system, everyone caught crossing the U.S. border improperly. On April 23, an internal Homeland Security Department memo obtained by the Washington Post called for the referral for prosecution of “100 percent” of adults apprehended at the border, “including those initially arriving or apprehended with minors,” and including those expressing fear of returning to their home countries. As parents would be sent to federal prison facilities, the policy would require that their children be separated from them. In fact, all past U.S. administrations, even the Obama administration, have reserved the right to impose “penalties” for unlawful entry and prosecuted a small number of asylum seekers. But only the Trump administration has ever tried to do so massively. Since 2005, though, the Bush, Obama, and Trump administrations have prosecuted a sizeable portion of border-crossers for unlawful entry under “Operation Streamline,” an initiative that sends tens of thousands through federal criminal courts, dozens at a time, each year. Until now, Streamline—which is very active in Texas and Arizona and now getting underway in California—very rarely prosecuted parents traveling with their children or asylum-seekers for improper entry. With zero tolerance, the Trump administration’s goal is now to “streamline” everyone. The experience of zero tolerance’s first two months has revealed it to be cruel, a drain on resources, and unlikely to deter future migrants. Federal courts and prisons have already run up against serious and foreseeable capacity issues. The zero-tolerance push has brought border-area federal courts to capacity, or beyond capacity. There aren’t enough judges, prosecutors, defenders, or holding space. Dockets are overflowing, even though most cases just end up in “time served” sentences. Swamping courts with misdemeanor improper entry cases reduces their bandwidth for dealing with more serious federal crimes, like drug trafficking. “It means we don’t have the time that we need to handle our felony cases,” Marjorie Meyers, federal public defender for the Southern District of Texas, told the Houston Chronicle. In San Diego, the number-one sector for heroin, fentanyl, and methamphetamine smuggling, USA Today found early evidence that border authorities are sending more felony drug-smuggling cases to California state courts, and fewer to federal courts, because of the additional burden immigration cases are adding to federal jurisdictions. As has been reported by Human Rights First, in the case of asylum seekers, rather than sending them to a credible fear interview or immigration courts, CBP is referring them for criminal prosecution. Once in court, even if an asylum seeker or their lawyer tries to raise their asylum concerns, judges frequently respond that they lack authority for immigration matters and that the person needs to first serve their prison sentence. When agreeing to plea guilty for illegal entry, some migrants even sign waivers that force them to give up their claim for asylum. Those who end up getting sentenced under zero tolerance, which includes repeat offenders often jailed for 30 to 75 days, are rapidly swelling the federal prison population. The El Paso Times reported that the new policy could be contributing to a 30 percent increase in the number of federal inmates in that city’s county jail, which has a contract with U.S. Marshals to provide space for federal inmates. Beyond parent-child separation, discussed at length in a subsequent report, time in federal prison creates other hardships for migrants and asylum-seekers. WOLA spoke to two tearful Mexican women who had just been deported to San Luis Rio Colorado, Sonora after serving 30-day terms. Both had originally crossed the border through Mexicali, 50 miles away, and had been arrested with their husbands. Neither had any idea where her husband now was, or had a way to contact him. Both had their identification documents, money, and mobile phones taken from them while in custody, and not returned. CBP will hold a migrant’s belongings up to 30 days after apprehension, and the local repatriation arrangements between the U.S. and Mexico require agencies to take all feasible steps to return belongings before detained migrants are repatriated. However, as migrants are often transferred to different agencies, and particularly if they are prosecuted and are in the custody of the U.S. Marshals, there is a greater possibility that a person’s belongings will never be returned. The numbers, however, don’t show a deterrent effect. Migrants, including thousands of asylum-seekers, keep arriving at and between the ports of entry, even at a time when zero tolerance and resulting family separations were dominating world headlines. In Arizona, authorities and advocates noticed an apparent drop in new migrants during the first half of June, compared to May, though there was some recovery later in the month. By the end of the month, CBP data showed an 11 percent May-to-June increase in arrivals of family members in Arizona’s two sectors. This was offset, though, by a 40 percent drop in arrivals of unaccompanied children, for an overall decline of 18 percent fewer family and child migrant arrivals in Arizona. This tracks a border-wide trend of virtually unchanged family-member arrivals from May (9,491) to June (9,447), along with a 20 percent drop in unaccompanied children, for an overall 8 percent drop in children and families. A statement from the Homeland Security Department credited “the implementation of the Administration’s zero-tolerance policy” for this decline. But in fact, a May-to-June drop is normal. Border Patrol almost always measures fewer migrant apprehensions in June compared to May. It is scorchingly, dangerously hot in the arid deserts along the southwest border in June, and fewer migrants attempt the journey. Counting all migrants—not just children and families—between 2000 and 2017, the average monthly drop from Mays to Junes at the U.S.-Mexico border was 21.3 percent fewer migrant apprehensions. That’s 5.9 percentage points steeper than June 2018’s 15.4 percent decrease in all migrants. That indicates no deterrent effect at all from zero tolerance. Focusing just on children and families, in the five prior years for which we have border-wide data (2013 to 2017), the number of apprehended children and family-unit members actually increased by an average of 8.3 percent from Mays to Junes. In June 2018, though, children and families decreased by 8.2 percent. That decrease is virtually identical to the drop measured between May and June 2016, the last year of the Obama administration. Studies of past “low-tolerance” efforts, like Streamline, also point to little deterrence. A June 2018 study by the Vera Institute of Justice found “no evidence to suggest that Operation Streamline had any impact on migrants’ decisions to enter the United States.” The Homeland Security Department Inspector-General’s office also cast doubt on claims that Streamline reduced recidivism among border-crossers, as recidivism rates appeared to remain similar in the long term. The “push factors” driving migration from Central America and Mexico remain largely unchanged. Over the last decade, these factors have sparked a dramatic increase in Central Americans seeking out asylum world-wide. According to data from the U.N. High Commissioner for Refugees, between 2011 and 2017 the amount of asylum seekers from Northern Triangle countries seeking out asylum in the United States increased by 1,089 percent. Other neighboring countries like Costa Rica, Panama and Mexico also saw a similar spike in requests. Mexico saw the highest spike, with 1,971 percent more Northern Triangle migrants seeking out asylum in 2017 versus 2011. The increases in petitions for asylum align with the exodus of tens of thousands of families and children who began fleeing the Northern Triangle in 2013 due to insecurity and violence. Overall indices of violence have improved since then, but still vary drastically by geographic location within each country. In the Northern Triangle, homicide rates dropped after 2015 from “record high” to “extremely high,” while Mexico has never recorded levels of violent crime as high as today’s. 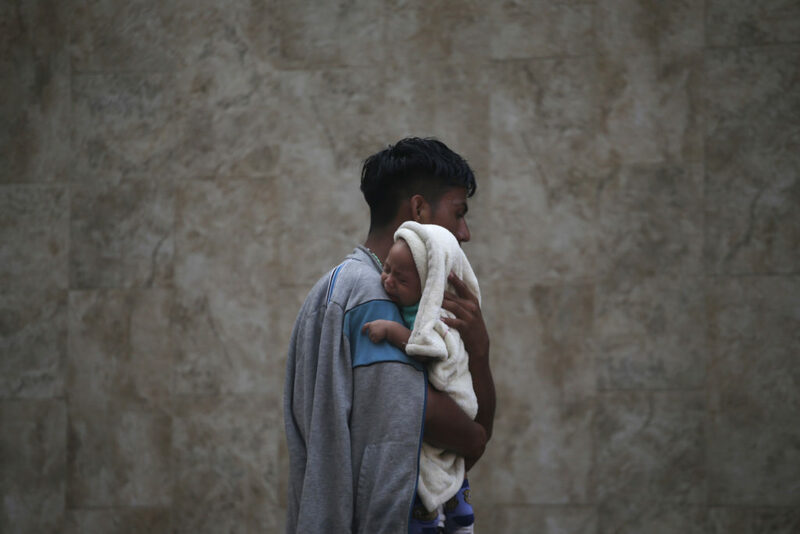 Central American asylum-seekers say they are still fleeing extortion, gang violence or forced recruitment, domestic abuse, gender violence, or targeting for collaboration with police. Mexican asylum-seekers are fleeing for similar reasons, including the wide reach of organized criminal groups in Mexico and the collusion between many public officials and these groups. Across the board, we heard from asylum seekers the perception that their own government is unable or unwilling to protect them, or that it is part of the problem. About half of children and families arriving from Central America’s Northern Triangle (El Salvador, Guatemala, and Honduras) come from Guatemala, which has a larger population than the other two countries combined. In Arizona, the vast majority of Central American asylum-seekers, about 88 percent so far this year in Yuma and a similar amount in Tucson, are Guatemalan. Shelters WOLA visited in Yuma and Tucson said that most families they received came from Guatemala. This probably owes to smuggling patterns: there appears to be a well-established smuggling network originating in Guatemala and ending in Arizona. This network appears to be favoring the border’s Yuma and El Paso sectors. Apprehension numbers of children and family migrants are lower in Tucson, a traditionally much busier sector flanked on the east and west by Yuma and El Paso. This is a mysterious pattern that none could explain, although one Nogales service-provider shared a rumor that, in some parts of Mexico across from the Tucson sector, narcotraffickers are trying to discourage Central American migrants from crossing, and kidnapping a number of them. While many Guatemalan asylum-seekers come from violent urban neighborhoods, a surprising number are coming from the country’s rural, indigenous-majority highlands. This is the poorest part of the country, hit hard by the 1960-1996 civil war, and it has been widely assumed that migration from the highlands was driven by economics, not insecurity. Today, though, shelter personnel and asylum lawyers say that violence is a greater factor in rural areas as well. The perpetrators in Guatemala may not be big gangs like MS-13 as much as local criminals, often tied to narcotraffickers, who operate with the acquiescence of local government and security forces. Indigenous Guatemalans fleeing the highlands, many of whom speak Spanish as a second language, tell of “ladinos” (non-indigenous Guatemalans) who extort any small business beyond their ability to pay, and of an increasing number of forced displacements either to steal landholdings or to consolidate control over cocaine and poppy trafficking routes. 85 to 90 percent of all cocaine consumed in the United States passes through Mexico and Central America on its way from the Andes; while a minority of that amount is transshipped directly to Mexico, the rest passes at some point through Guatemala, and often its highlands. Less than 10 percent of children and families coming to Arizona are Mexican. Most come from states along the Pacific coast, especially Guerrero and Michoacán, that have been hit very hard by organized crime-related violence. At the Nogales port of entry, WOLA spoke to two mothers from Guerrero, who had fled with their children two weeks earlier. Armed groups had killed one woman’s sister-in-law. One group had cut off electricity to their town and was blocking repair crews. The community is confined, schools are closed, basic goods are running scarce, and the local armed groups appear to have been specifically targeting women and children. One of the women expressed concerns about the possible forced recruitment of her 14 year-old son by a criminal organization. On the morning they fled, a shootout was happening in the middle of town. Zero tolerance has caused an increase in asylum-seekers reporting to the 45 land ports of entry along the U.S.-Mexico border, where it is still legal to petition CBP officers for asylum. (We discuss the situation at ports of entry in a subsequent report.) Even after two months of zero tolerance, however, most asylum-seekers continue to cross between the ports of entry. In Arizona, despite the new high probability of arrest, asylum-seeking families crossing between ports of entry still tend to seek out Border Patrol agents. In the heavily fenced-off Yuma and Tucson sectors, this often means climbing the border fence. In Yuma, this tends to happen in areas where the fence is still relatively short, made of metal sheets that once served as landing mats for helicopters during the Vietnam War. Often, the ground is much lower on the U.S. side than on the Mexican side, resulting in fractures and other injuries from drops of as high as 18 feet. Still, entire families climb, with smugglers wrapping small children in blankets, throwing them up, and dropping them to parents on the U.S. side. Border Patrol agents complain about having to process and attend to so many children and families, which pulls them away from security duties and a social-work task for which they are not trained. Law enforcement and non-governmental advocates agreed that smugglers continue to cross with migrants between ports of entry, despite zero tolerance. While many migrants are unaware that improper entry is now being prosecuted, most also have little choice about whether to cross in between the ports of entry or at the port: they go to where their smuggler directs them. While it would make the most sense for smugglers to bring migrants to the ports of entry, they may lack the freedom to do that. For at least the last 10 years, organized crime (often referred to locally as “the cartel”) has consolidated tight control over who and what crosses the border illegally on the Mexican side. This control was enabled by the post-2006 construction of high fencing in the Yuma and Tucson sectors, which channeled cross-border activity to narrower bottlenecks and chokepoints that criminal groups could monitor more easily. It is now very dangerous to attempt to cross the border without the approval of organized crime, and smugglers must pay a cut to “the cartel” in order to bring migrants across. The reason why smugglers haven’t adjusted their routes, then, is that they cannot: they can only cross migrants where organized crime allows them to do so. At times, they are instructed to cross in a certain area in order to divert U.S. authorities away from a drug shipment in another area. If a smuggler’s designated territory does not include a port of entry, then migrants must cross as they did before zero tolerance: by climbing a fence or crossing the Rio Grande and seeking out Border Patrol. In these cases, asylum-seeking families have no real choice but to violate the improper entry statute in order to request protection. In other cases, migrants traveling on their own do not know where to request asylum, only that they want to apply for protection in the United States. For others, after repeated attempts to request asylum at a port of entry, migrants become frustrated and cross in between ports to present themselves to Border Patrol agents to request protection. Abandon the “zero tolerance” standard. Reserve criminal prosecution for only the most egregious, multiple-recidivist border crossers. Migrants credibly seeking protection should never be prosecuted for improper entry. Never implement a policy that deliberately increases migrants’ misery—and especially not one that harms children—as a “deterrent” to potential future migrants. Recognize that people fleeing for their lives are unlikely to be deterred by detention in the United States. If they are criminally charged, migrants who fear returning to their countries must have a clear opportunity to express that fear and seek asylum. U.S. agents should not be permitted to pressure asylum-seekers to accept voluntary return to their country as a way to be released from detention. Increase inter-agency cooperation to avoid loss of migrants’ belongings during transfers and in the deportation process. Continue to involve consular authorities in ensuring that migrants who have already been deported have their belongings returned to them. If married migrants are prosecuted, ensure that the separated spouses know each other’s whereabouts while in detention and when they are being repatriated to Mexico or Central America. Border Patrol should consider employing child welfare specialists and others who are trained in assisting families for the processing of children and families. This would free up more agents for work in the field. Continue to expand search-and-rescue efforts for migrants in distress in U.S. borderlands, especially during summer months. Increase vigilance, the use of rescue beacons, and the availability of water stations, along routes where large concentrations of remains are found, especially around checkpoints. Border Patrol should not destroy or tamper with water left by humanitarian organizations. Office of Public Affairs, Department of Justice, “Attorney General Announces Zero-Tolerance Policy for Criminal Illegal Entry,” April 6, 2018, https://www.justice.gov/opa/pr/attorney-general-announces-zero-tolerance-policy-criminal-illegal-entry. Maria Sacchetti, “Top Homeland Security officials urge criminal prosecution of parents crossing border with children,” Washington Post, April 26, 2018, https://www.washingtonpost.com/local/immigration/top-homeland-security-officials-urge-criminal-prosecution-of-parents-who-cross-border-with-children/2018/04/26/a0bdcee0-4964-11e8-8b5a-3b1697adcc2a_story.html?noredirect=on&utm_term=.106af79b8032. Human Rights First, “Report Documents Administration’s Shameful Criminal Prosecution of Asylum Seekers at Border,” Human Rights First, January 18, 2018, https://www.humanrightsfirst.org/press-release/report-documents-administration-s-shameful-criminal-prosecution-asylum-seekers-border. United Nations Human Rights Office of the High Commissioner, “Protocol relating to the Status of Refugees,” October 4, 1967, https://www.ohchr.org/EN/ProfessionalInterest/Pages/ProtocolStatusOfRefugees.aspx. United Nations Human Rights Office of the High Commissioner, “Convention and Protocol Relating to the Status of Refugees,” October 4, 1967, http://www.unhcr.org/en-us/3b66c2aa10. Dara Lind, “The Trump administration’s separation of families at the border, explained,” Vox, June 15, 2018, https://www.vox.com/2018/6/11/17443198/children-immigrant-families-separated-parents. Mark Motivans, “Federal Justice Statistics, 2014 – Statistical Tables,” Bureau of Justice Statistics, March 2017, https://www.bjs.gov/content/pub/pdf/fjs14st.pdf. Federal Bureau of Prisons, “Statistics,” Federal Bureau of Prisons, Last updated: July 5, 2018, https://www.bop.gov/about/statistics/population_statistics.jsp. Rick Jervis, “New ‘zero tolerance’ policy on border creates overflow court hearings in South Texas,” USA Today, June 6, 2018, https://www.usatoday.com/story/news/2018/06/06/zero-tolerance-parents-separate-trump-immigration-border-courts/677981002/. Brad Heath, “Trump administration’s ‘zero tolerance’ border prosecutions led to time served, $10 fees,” USA Today, June 21, 2018, https://amp.usatoday.com/amp/722237002. Jervis. “New ‘zero tolerance’ policy. WOLA interview with migrant advocate, Nogales, June 21, 2018. Rafael Carranza, “Faith groups to feds: Migrant family separation not ‘consistent with biblical values,’” AZ Central, June 4, 2018, https://www.azcentral.com/story/news/politics/border-issues/2018/06/04/religious-groups-push-back-against-border-separations/670182002/. WOLA interview with public defender, Tucson, June 22, 2018. Miriam Jordan, “Swift Frontier Justice for Migrants Brought to Federal Courts,” New York Times, June 19, 2018, https://www.nytimes.com/2018/06/19/us/border-immigration-courts.html?smid=tw-nytimes&smtyp=cur. Lomi Kriel, “New ‘zero tolerance’ policy overwhelms South Texas courts,” Houston Chronicle, June 9, 2018, https://www.houstonchronicle.com/news/houston-texas/texas/article/New-zero-tolerance-policy-overwhelms-South-12981190.php. Brad Heath, “Trump’s immigration crackdown ‘diverting’ resources from drug cases,” USA Today, June 22, 2018, https://www.usatoday.com/story/news/2018/06/22/zero-tolerance-immigration-crackdown-diverting-resources-drug-cases/727532002/. Michael E. Miller, “’They just took them?’ Frantic parents separated from their kids fill courts on the border,” The Washington Post,” June 9, 2018, https://www.washingtonpost.com/local/they-just-took-them-frantic-parents-separated-from-their-kids-fill-courts-on-the-border/2018/06/09/e3f5170c-6aa9-11e8-bea7-c8eb28bc52b1_story.html?utm_term=.8aeccc85aadd. Michael D. Shear, Ron Nixon, and Katie Benner, “In Tense Meeting, Trump Officials Debate How to Process Migrant Families,” New York Times, June 22, 2018, https://www.nytimes.com/2018/06/22/us/politics/donald-trump-immigration-midterms.html. Alfredo Corchado, “Tents are going up near El Paso for children being separated from immigrant parents,” Dallas News, June 15, https://www.dallasnews.com/news/immigration/2018/06/15/tents-going-near-el-paso-children-separated-immigrant-parents. Carolyn Scorpio and Maureen Meyer, “New U.S.-Mexico Local Repatriation Arrangements are a Step Forward,” Washington Office on Latin America, February 26, 2016, https://www.wola.org/analysis/new-us-mexico-local-repatriation-arrangements-are-a-step-forward/. Walter Ewing and Guillermo Cantor, “Deported with No Possessions: The Mishandling of Migrants’ Personal Belongings by CBP and ICE,” American Immigration Council, December 21, 2016, https://www.americanimmigrationcouncil.org/research/deported-no-possessions. John Burnett, “Transcript: White House Chief of Staff John Kelly’s Interview with NPR,” NPR, May 11, 2018, https://www.npr.org/2018/05/11/610116389/transcript-white-house-chief-of-staff-john-kellys-interview-with-npr. Molly Hennessy-Fiske, “Was a breastfeeding infant really taken from an immigrant mother? The answer to this and other questions about families separated at the border,” Los Angeles Times, June 16, 2018, http://www.latimes.com/nation/la-na-immigration-families-border-wall-20180616-htmlstory.html. Nomaan Merchant, “Hundreds of children wait in Border Patrol facility in Texas,” AP News, June 18, 2018, https://www.apnews.com/9794de32d39d4c6f89fbefaea3780769. U.S. Customs and Border Protection, “U.S. Border Patrol Southwest Border Apprehensions by Sector FY2018,” U.S. Department of Homeland Security, July 5, 2018, https://www.cbp.gov/newsroom/stats/usbp-sw-border-apprehensions. WOLA Defense Oversight Research Database, “Library of Reports,” Washington Office on Latin America, https://defenseoversight.wola.org/reports/127. U.S. Department of Homeland Security, “Statement from DHS Press Secretary on June Border Numbers,” U.S. Department of Homeland Security, July 5, 208, https://www.dhs.gov/news/2018/07/05/statement-dhs-press-secretary-june-border-numbers. Michael Corradini, Jonathan Allen Kringen, Laura Simich, Karen Berberich, and Meredith Emigh, “Operation Streamline: No Evidence that Criminal Prosecution Deters Migration,” Vera Institute of Justice, June 2018, https://www.vera.org/publications/operation-streamline. Office of Inspector General, “Streamline: Measuring Its Effect on Illegal Border Crossing,” U.S. Department of Homeland Security, May 15, 2015, https://www.oig.dhs.gov/assets/Mgmt/2015/OIG_15-95_May15.pdf. United Nations Human Rights Office of the High Commissioner, “Population Statistics,” UNHCR Asylum-Seekers (Refugee Status Determination), http://popstats.unhcr.org/en/asylum_seekers. WOLA interview with law enforcement, Yuma, Arizona, June 20, 2018. WOLA interview with migrant shelter, Yuma and Tucson, Arizona, June, 2018. WOLA interview with legal aid organization,Tucson, Arizona, June 21, 2018. U.S. Department of Homeland Security, “Unaccompanied Alien Children (UACs) by Location of Origin for CY 2014: Honduras, El Salvador, and Guatemala,” Homeland Intelligence Today, May 27, 2014, http://adamsdocs.org/files/dhsuacmap.pdf. WOLA Defense Oversight Research Database, Clips from “International Narcotics Control Strategy Report,” March 2, 2017, https://defenseoversight.wola.org/clip/3406; “Central American Regional Security Initiative: Background and Policy Issues for Congress, December 17, 2015 https://defenseoversight.wola.org/clip/1375. WOLA interview with two migrant mothers from Guerrero, Arizona, June 20, 2018. Infobae, “La violencia expulse de sus pueblos a los habitantes de 10 comunidades en Guerrero,” Infobae, June 15, 2018, https://www.infobae.com/america/mexico/2018/06/15/violencia-expulsa-de-sus-pueblos-a-los-habitantes-de-10-comunidades-en-guerrero/. Julie Hirschfeld Davis and Michael D. Shear, “How Trump Came to Enforce a Practice of Separating Migrant Families,” New York Times, June 16, 2018, https://www.nytimes.com/2018/06/16/us/politics/family-separation-trump.html. 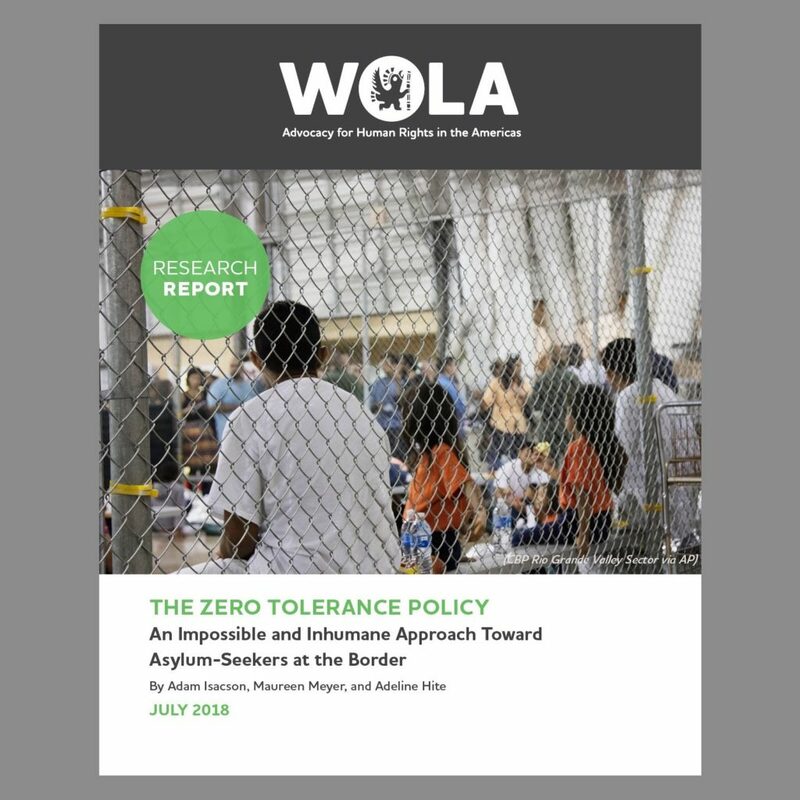 WOLA interview with migrant shelter, Arizona, June 21, 2018. Eli Rosenberg, “Her 7-year-old was taken as she sought asylum. Now she’s suing to get him back,” Washington Post, June 20, 2018, https://www.washingtonpost.com/news/local/wp/2018/06/19/her-7-year-old-was-taken-at-the-border-as-she-sought-asylum-now-shes-suing-to-get-him-back/?noredirect=on&utm_term=.b350b85c73b7. WOLA interview with Human Rights Center, Tucson, Arizona, June 20, 2018.